Secret hide-a-way tucked in the trees among the hydrangea and just 1/10 mile from Burton Baker Beach at Indian Neck on the Bay in Wellfleet. Just stroll down the sandy lane and the beach is there waiting for you. The house has an open floor plan with living/dining/kitchen, cathedral ceilings, wrap around windows and sliders to the deck admitting lots of natural light and sunshine, and some views of the bay. Also on the main level is the master bedroom suite with sliders to the deck and bath with shower. The lower level has two bedrooms both opening to the lower deck, full bath with tub/shower and laundry. There is also an enclosed outdoor shower for those who enjoy bathing out in nature after a day at the beach. The grounds are lovely and very private. The perfect vacation retreat. We purchased this House in 2009. We live in Northampton, MA. known as the Pioneer Valley. While there is great beauty and culture in our area with the 5 colleges and the Holyoke Mountain Range in the background, by springtime the salt air of the ocean beckons. Having grown up in the New York area, we spent our childhood going to the beaches on Long Island. When we moved to Massachusetts 40 years ago we were looking for a beach to take our children to in the summer and discovered the beauty of Cape Cod. We fell in love with Wellfleet and our absolute favorite part is Indian Neck and the bayside of Wellfleet. (Although the ocean is not far away.) 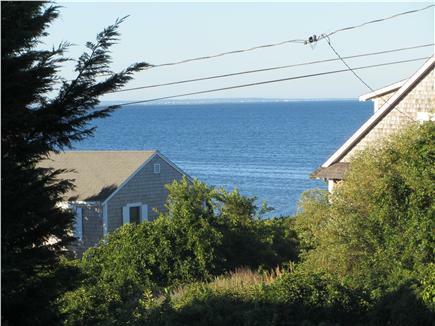 Now we are lucky enough to own our own sunny, beautiful contemporary 1/10 mile from Burton Baker Indian Neck Beach and want to share it with others. Not only is our house close to the beach, with views of the bay from the living room and deck, there is a wonderful upper deck with panaoramic views of the bay and Great Island. You can walk to the beach, and conservation land, and enjoy boating in Chipman's Cove and Wellfleet Harbor. It is a short drive to Wellfleet with its wonderful art galleries and restaurants. Wellfleet is the best of the outer cape. It has a lovely downtown area with galleries, shops and restaurants and a pier and marina for boating and community activities. It has a park with a great childrens' playground and tennis courts and a skateboard park. Wellfleet is home to several large ponds for swimming as well as three ocean beaches. There is ample sightseeing, culture and outdoor adventure right at your door. Wellfleet is also a short drive to Provincetown and Orleans.